Once in about five years, I get a crafty fit. It’s a condition to beware of, as I’m exceptionally unskilled. 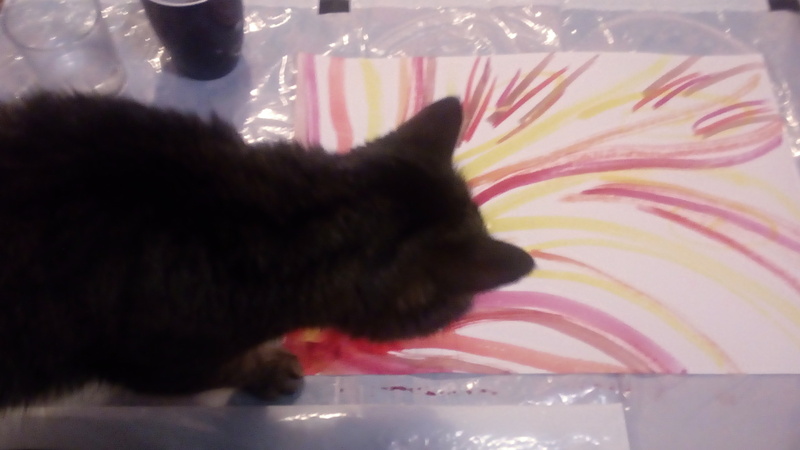 That doesn’t prevent me from attempting, pentannually, dyeing, crocheting or (visual artists forbid) painting. Today I sat down with the determination to paint something. 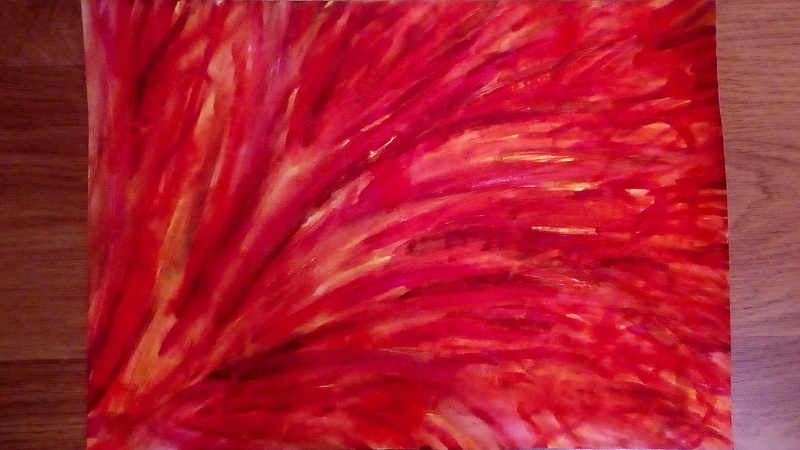 More precisely, to paint nothing, since I can’t paint anything that would look like something, preferably itself. So, to the natural question as to what my artwork represents, I respond nothing. 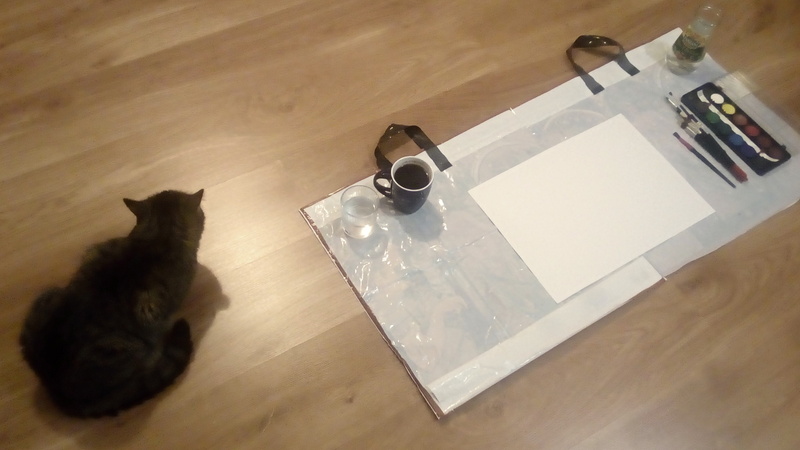 The mission starts with painting and drinking supplies spread on a plastic bag and a doubtful cat. 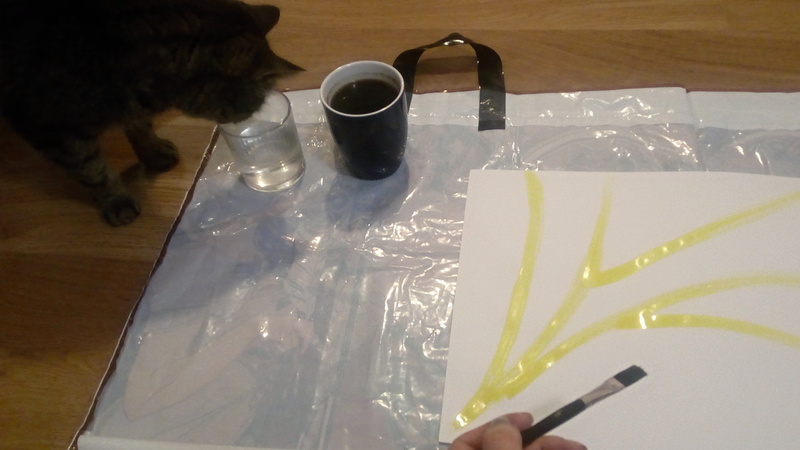 I’m attempting the first shaky strokes, while the cat is making free use of my drinks. Half the coffee is gone, and I’m wondering what the heck I’m doing. The cat is severely critical of the result so far. I ran out of coffee and of straight lines, so I’m starting on curly ones. I want to get all the white space covered with paint. 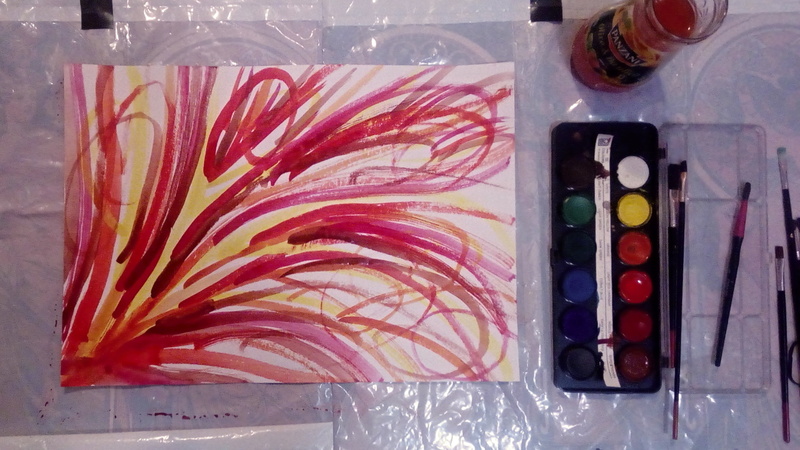 Soak brush in water, smear it all over the paper and, tada, white space is gone! P.S. After this painting and photo-taking session, I realised that the reason the photos turned out so poor is that I had my flash turned off all the time. And why, no, I never noticed that the flash wasn’t flashing. That pretty much explains everything. My ten year old just said, “Ooh that’s cool!” so there’s your first feedback. I find art and other creative things are important to my sense of wellbeing, whatever the success or failure of the outcome. It’s great decompression. Awe, that’s cool! Say hello to your kid! I did find the process of randomly applying colour on paper therapeutic as well. I might attempt again sooner than in my usual five years. Though it is a shame that I can’t really do anything crafty. I think if you were to practice, you would find that you honed your abilities and discover you are much better than you think. I can see evidence of some good quality mark making and an eye for colour in there. A year ago, I would say to people, “I can draw but I can’t paint” whereas regular practice with painting means I now say that I can draw and paint – but my painting skills need some further development. So if it is something you enjoy, if you find it somehow therapeutic, then my advice is to eke out time for it and I am sure you will find you get better at it as well as finding it beneficial. Haha, your interpretation is not only amusing, but probably also quite accurate 🙂 Thank you for your lovely analysis! I feel almost encouraged to make more no-art. At least, it’s fun! Hats off to you! You DID something at least. That’s more than I can say. I really want to, but I know I can’t so I end up doing nothing. Besides, I have this hang-up about «art» … WHEN something becomes ‘art’. I don’t understand art. I have some many people on my FB list … they are ‘creating so much art’, and I don’t know what it is. I’m very conservative when it comes to art. I could be said to actively hate conceptual art, and I don’t think too much about most abstract art either. Fortunately, I don’t create art, I just amuse myself 🙂 I enjoyed my painting session more than I thought I would. Maybe you’ll pick your pencil to draw again? If I set out to create anything particular, I’d fail pathetically; but since I just told myself I’d paint lines and see if it leads anywhere, I found the activity enjoyable. Though of course I also took it as a mission, I’m this kind of a goal-oriented person. Holding your art journal is actually an act of art too, isn’t it 😉 I was thinking about painting a little for a long time, and when I took the pictures of my boxes, including the one with art supplies, it made me actually do it at last. I had more fun than I expected. 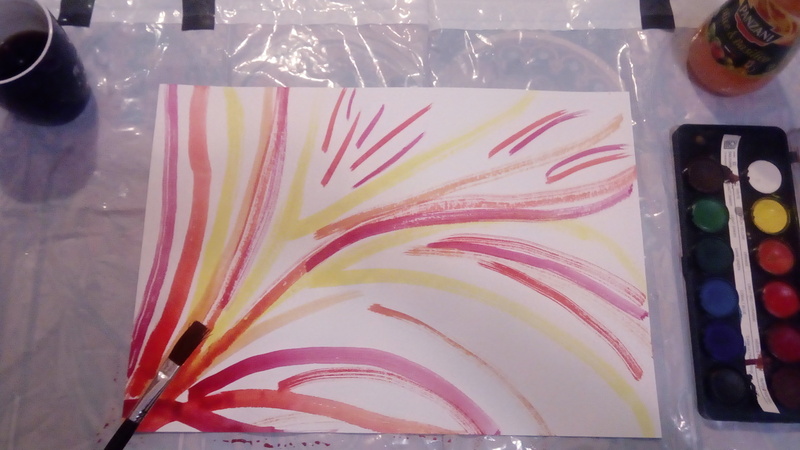 Your art journal puts my little painting to shame, of course, but I find it motivating rather than discouraging! And yes, we should create more. When I was painting, I found I had troubles with motorics in my hand because I don’t even write in longhand anymore, I just type everything. I was a bit alarmed 😮 Need to practise more! Nooo, your painting is totally beautiful!!! ❤ You just went on with your flow and that's fantastic! Aaaaah, I totally know what you mean – I get cramps in my wrists now when writing for a while – I was totally alarmed as well!!! Oh well, thank you, it’s not beautiful, but it served its purpose – to have some fun and relax – and I expected it to be even worse! Actually I love the layers of color and shapes. ha ha this is brilliant! Sooo – probably the only person in the world more un-artsy than you would be me. … and unlike you, I don’t even try to create something every 5 years. I would still be looking at the blank sheet of paper wondering what I should do with it. That’s a long way to say, I think your painting is pretty cool. 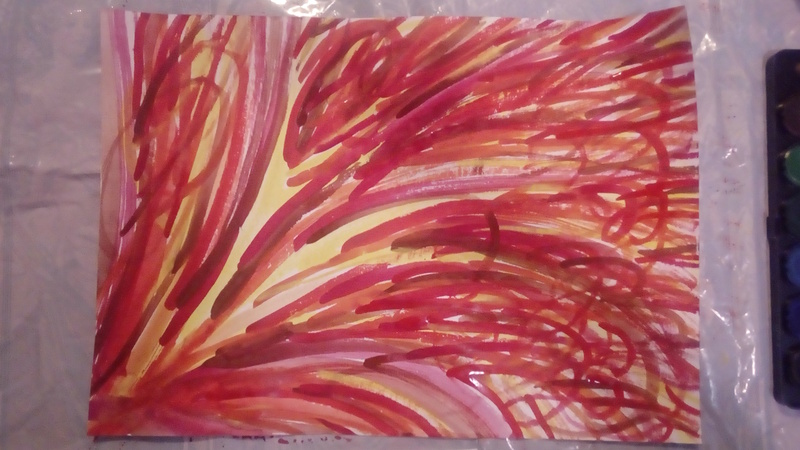 I wouldn’t have the creative insight to soak brush in water then smear it all over the paper! You might be just too critical of yourself! But no need to force yourself into creating anything when it’s not your thing. It’s not my thing either, I did it as a joke. I expected I would create something hilariously bad and we would all have a good laugh over it when I blog it. Well, it turned out just normal bad. I’ll need to try harder! i just found this! You have an innate skill for creating 🙂 You do ! And you’re too kind, as usual!